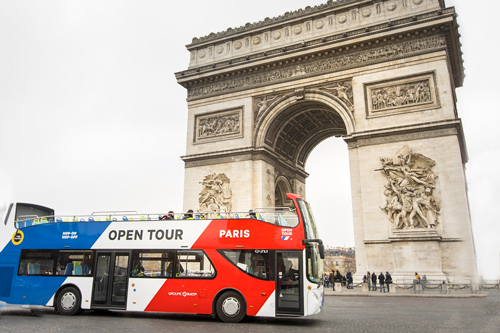 See the principal Paris attractions on a double-decker sightseeing bus! Leave behind the stresses of using public transport, the searching for coins with which to pay the tickets, having to change the mode of transport. Enjoy your well-deserved holidays to the full on board an open air double-decker tourist bus. Four routes and 38 stops&which have been organised to provide the best service possible and the chance to discover more than 100 unmissable Paris attractions.Want to visit the Louvre? Or the perfume museum? Or, may Musée d'Orsay? Whatever your destination, with a Tourist Bus you will arrive directly at your destination in a relaxed fashion.Jump on and jump off whenever you want or just enjoy the spectacular views from the top floor of the bus. With the Tourist Bus, you won't waste any time looking for the main attractions and you also won't need to get stressed about having to change to a different means of transport! Let yourself be taken around the city by an experienced driver and enjoy fantastic views of The City of Light. Travelling by bus is the best way to see the most interesting attractions in Paris in the quickest time as you decide what to visit and you can hop on and hop off whenever and wherever you want! With this pass you will have the opportunity to see the best of the city whilst sitting comfortably. The service is available every day from 09:30 to 20:00 (depending on the route) and you can choose to buy a pass for 1, 2 or 3 consecutive days. Included in the price of the tickets is the audio-guide and Wi-Fi on board so that you can publish photos of your vacation immediately. Hop on and hop off whenever you want or just stay on board for a complete panoramic tour of the city. The Tourist Bus passes in front of all the principal Parisian attractions and you can admire them all from the open top deck! You can choose a pass from 1 to 3 consecutive days. Yellow Line: from 09:30 to 19:40 hours. Yellow Line: around 35 minutes. Yellow Line: a bus every 35 minutes.